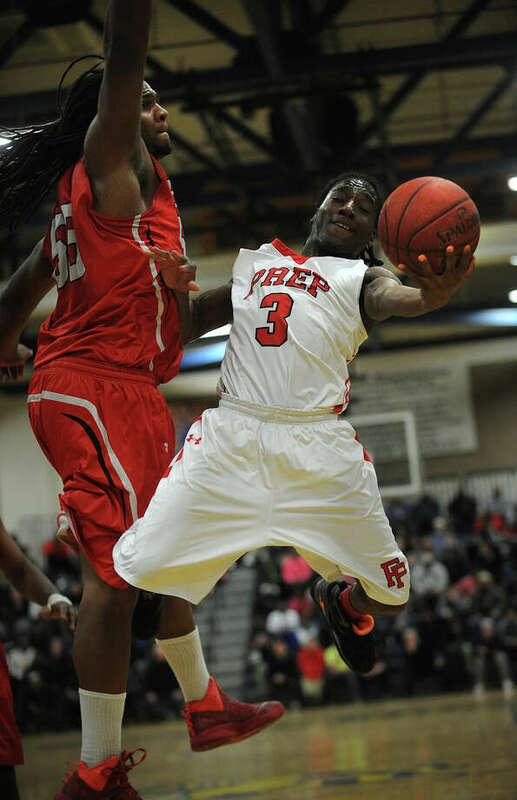 Fairfield Prep's Keith Pettway drives to the basket against Wilbur Cross defender Jaelin Robinson in the first half of their SCC boys basketball semifinal game at East Haven High School in East Haven, Conn. on Monday, March 3, 2014. EAST HAVEN -- All season, Fairfield Prep has dodged upset bids in a variety of ways. From a 33-point dismantling of Branford to start the year in December to a four-point nail-biter over Notre Dame-West Haven in the SCC quarterfinals on Saturday, the Jesuits have done enough to remain the state's unanimous No. 1 team. They will remain such, for at least another few days. Despite losing two starters, including all-state center Paschal Chukwu, to foul trouble in the second half Monday, Prep held on to defeat fourth-seeded Wilbur Cross 75-71 in the conference semifinals at East Haven High. Guard Thomas Nolan scored a game-high 26 points, including 12 straight late in the third with Chukwu on the bench, to lift the Jesuits (22-0) to the SCC final for the second straight year. The state's lone unbeaten will face No. 3 Hillhouse -- a 63-47 winner over No. 2 Career -- on Wednesday at 7 p.m. at Quinnipiac's TD Bank Sports Center. The two teams met in last year's final as well, with the Academics winning 53-47 in overtime. "I knew I had to step up. Luckily I did," Nolan said. Point guard Keith Pettway did the same for the Jesuits, scoring 19 points on a 13-of-18 night from the free-throw line. The Jesuits played the final five minutes without the 7-foot-2 Chukwu, who fouled out with the Jesuits up 58-56. The lead traded hands four times over the next few minutes, before the Jesuits jumped ahead for good, 64-62, on Patrick Harding's baseline jumper with two minutes left. "When the going gets tough, we seem to pull them out," Prep coach Leo Redgate said. Cross (16-6) got 24 points from Chan Williams-Bey and 21 from Josh Fleming, including five 3-pointers. Despite dealing with foul trouble of their own, the Governors remained close, but a few mistakes doomed them. They had a chance to tie after Nolan hit one of two free throws to make it 74-71, but Nolan forced a turnover with 10.9 seconds left. "He's got a fire that most kids never see," Redgate said of the junior shooting guard. "He almost wills us to win." The Governors were also whistled for an intentional foul with 1:24 left, giving the Jesuits -- up two at the time -- two free throws and the ball. Prep was plagued by foul trouble in the first half, as Chukwu and guard Dave Zielinski both picked up three fouls. Chukwu's third with 31 seconds remaining -- on a conventional 3-point play by Williams-Bey -- gave Cross a 31-29 lead entering the break. The Jesuits' center was charged with his fourth foul with 4:58 left in the third. He returned to the floor at the start of the fourth and finished with 11 points. Cross trailed by six to start the fourth, but it regained the lead, 59-58, on a trey by Williams-Bey. Both teams traded turns holding a one-point lead before the freshman Harding's bucket. One win from their first SCC title, the Jesuits will take on a team they've beaten twice this season. And while they're eager tojoin the conference's list of champions, they're also looking beyond Wednesday. "We're looking at it as another game that can prepare us for the (Class LL) state tournament," Redgate said. Nolan added: "It is the championship and it would be nice to win. We're looking to get that state ring." Keith Pettway 3 13-18 19 Thomas Nolan 8 7-9 26 Ray Featherston 0 0-0 0 Dave Zielinski 0 0-0 0 Ryan Foley 5 1-3 13 Pat Harding 1 2-2 4 Joe DiGennaro 0 2-2 2 Paschal Chukwu 3 5-10 11 Richard Van de Berghe 0 0-0 0. Totals 20 30-44 75. 3-pointers: WC -- Fleming 5, Williams-Bey 2; FP -- Nolan 3, Foley 2. Fouled out: FP -- Chuwku, Zielinski. WC -- Robinson, Fuller.